My mom makes the most delicious potato soup. 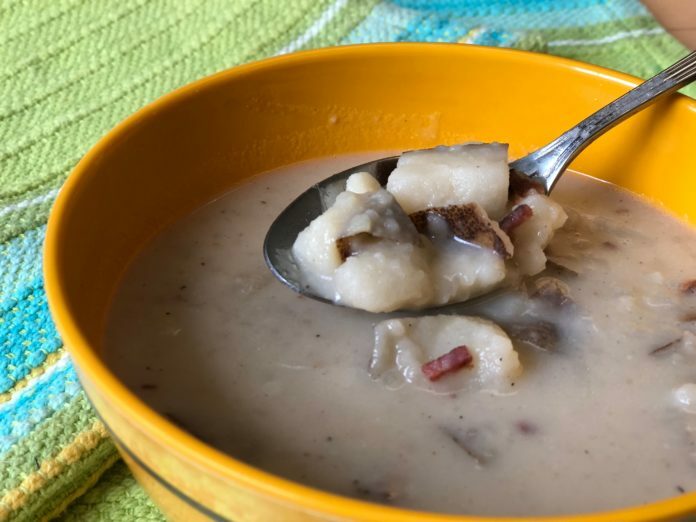 I know, lots of people have moms who make the best potato soup…but my mom, Pat, does have one of the BEST recipes I have even tasted, and even though my sister and my sister-in-law and I and others have tried, we never quite get that right flavor. There is something about Mom’s that is just so gosh darn yummy! But it has evaporated milk and crushed up crackers in it, and my dear daughter, who fights her lupus with a very strict diet, cannot have either of those items to eat. I have wanted to update the soup for her, and for the Instant Pot, and this late spring snowstorm we are having presented me with just the right time to try my hand at a new recipe. Because I love the Whole30 diet, and am about to start a round, I wanted to see if I could get this to be compliant with that way of eating, and it is also a Paleo recipe. 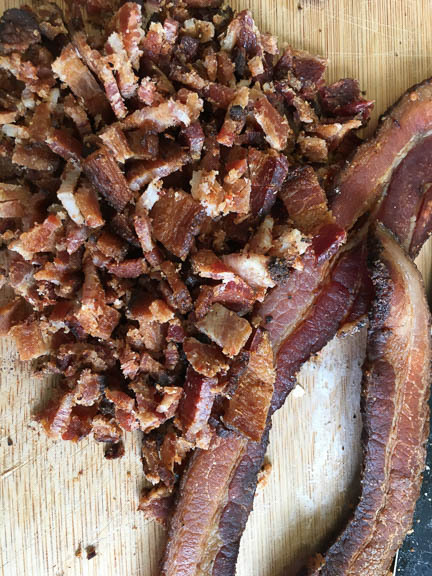 I use Paleo bacon so that it does not have any sugar in it. Your flavor will vary slightly with whatever bacon you use. I also use full fat canned coconut milk, but you can use the cow or nut milk of your choice…my mom would probably still like it better with the evaporated milk! 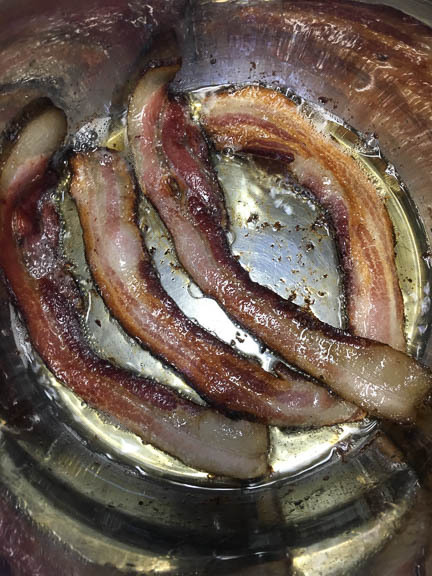 Some people flip a little when they think of putting bacon grease in anything…because the idea of the toxins in that fat make them all squicky inside. If that bothers you, don’t add it…I know where my bacon comes from so I am a bit spoiled in that regard. The added flavor is worth adding it! This should easily feed four people two bowls each, which they will want. If you are lucky you will have some for leftovers the next day, when it tastes even better! Any Paleo or Whole 30 cooks out there?! You will LOVE this Potato Soup Instant Pot Recipe. This is the ultimate comfort food potato soup, but with no dairy or gluten...an update of a classic recipe for those on a special diet. Cook the bacon in a separate pan, and cook it to just under too done. You want it to be sturdy when you cut it into little pieces. Drain the bacon and then when it is cool, chop the bacon into quite small pieces. Set aside. Turn the Instant Pot on to saute, and when it is hot, add the ghee to melt. Add the onion and cook for 4-5 minutes, stirring often. Add some salt and pepper here. Deglaze the liner with about a cup of the broth. Scrape all the little bits off the bottom, and then add the rest of the broth. Add all of your potatoes. I like a lot of spuds! Cover the potatoes with 2-3 cups of water so your amount of potatoes is just covered. Add the bacon grease from the pan you cooked your bacon in. Stir in. Cover and make sure you lid is correctly locked on. Set your toggle to sealing. Set manual/pressure cook for 15 minutes. Allow for a ten minute natural pressure release. Carefully open your lid. 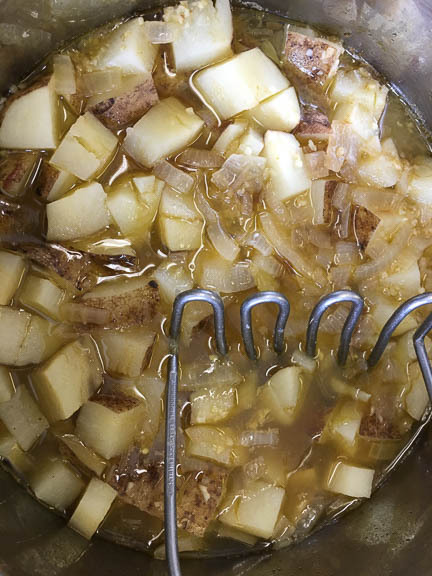 Take a potato masher and carefully mash the potatoes, stirring as you go. You want about half of the potatoes still in pretty nice chunks. Add the bacon pieces and stir in well. Add the can of full-fat coconut milk. Stir well, making sure to incorporate everything in the whole pot. Ladle a little of the soup out into a bowl, and cool it enough that you can taste it. Adjust the seasoning with some more salt and pepper. This soup can take quite a bit of black pepper, so be generous but careful.